Welcome to week 8 of the Stop, Drop and Roll Quilt Along! I am hosting this for the Old Red Barn Co. Flickr group. Week 1: We made our blocks. Week 2: We assembled our quilt tops. Week 3: We basted our quilts. Week 4: We practiced some straight line quilting patterns. Week 5: We practiced some C curve quilting patterns. Week 6: We practiced some loopy quilting patterns. Week 7: We practiced some S curve quilting patterns. This week, all of the free-motion quilting patterns are based on a swirl. I used my Janome 6600 for this video. I used the darning foot on the machine and I dropped my feed dogs. For the top thread, I used Tutti from WonderFil, color TU31 Evergreen. For the bobbin thread, I used DecoBob. by WonderFil, color DB501 Evergreen. Today's free-motion quilting pattern is a spiral feather design. When I retrace, I don't try to retrace my lines exactly. I like the whimsical look of crossed lines. When I need to stop the machine, I stop in a corner or where two patterns overlap. If I stop in the middle of a design, the stop/start will leave a visible jog. Even though my first machine quilting teacher told me to "quilt fast and don't stop," I quilt rather slowly. I set my machine to the speed I want to quilt, and then put my pedal to the floor. This helps keep my stitches a consistent length. I stop frequently while quilting. This keeps me from getting a sore neck, allows me to reposition my hands, and gives me time to figure out where to place the next design. Check back tomorrow for the final swirl design! Today's free-motion quilting pattern is a border spiral design. Check back tomorrow for another swirl design! Today's free-motion quilting pattern is an overall spiral design. I was working at the Handi Quilter booth at the AQS show in Knoxville and Leah came by to try out the Handi Quilter Sweet Sixteen. She was probably at the show to see her quilt which won "best machine quilting." Yes, her quilt was that awesome. What could be better than that? She mentioned me on her blog. Welcome to week 7 of the Stop, Drop and Roll Quilt Along! I am hosting this for the Old Red Barn Co. Flickr group. Week 5: We practiced some C curve quilting patterns . This week, all of the free-motion quilting patterns are based on an S-curve. For the top thread, I used Tutti from WonderFil, color TU20 Storm. For the bobbin thread, I used DecoBob. by WonderFil, color DB302 Royal Blue. After filming, I realized that the darker blue thread did not show well on the black fabric. Sorry! Today's free-motion quilting pattern is called Elements. I used this design on my son's friends' graduation quilts. Those boys loved to have bonfires (with parental supervision, of course) and the design reminds me of flames. Today's free-motion quilting pattern is leaves. Stop back tomorrow for another S-curve design! Today's free-motion quilting pattern is a fancy fern. The current issue of Fabric Trends has the pattern for Papillon, a quilt designed by my good friends at the The Quilt Basket. I quilted their sample and thought I would show you how. Last week, I showed how I quilted the background of the butterflies. This week, I will show how I quilted the white border triangles. I pulled out my Quilter's Preview Paper to see what design might look nice. Next week, I will show how to quilt the brown sashing. Be sure to come back and check it out! Sunday Stash Report -- another wedding quilt finished!!! I finally finished a quilt this week. It was finished 40 hours before the wedding!!! That must be some kind of a record. 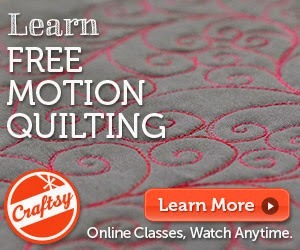 Please check out my free-motion quilting videos. A dear friend of mine is having some health problems and has been placed on an extremely restricted diet. The hope is that this can reverse the problem and avoid a lifetime of medications. Since I am (mostly) a vegetarian, I offered to show my friend how tasty vegetarian fare could be. I decided to cook some vegetarian meals that they could replicate and thought you might like to read about them, too. I cooked up one bundle and set them aside. Let cook for a few minutes until the sauce thickens. *sauce: I mix one cup of veggie broth with 2-3T of soy sauce, 1 T of rice wine vinegar (optional), and 1 T of cornstarch. I only use maybe 1/4 cup of this sauce for this amount of lo mein. Today's free-motion quilting pattern is a simple repeating S-curve.